To celebrate the release of the new 2nd Edition of this textbook, this month ACTEX sat down with the authors and discussed their approach to developing this textbook, among other things! 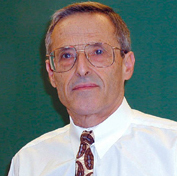 Len Asimow, PhD, ASA joined Robert Morris University in the fall of 2001 as Professor of Mathematics and Actuarial Science, and was the founding Director for the Actuarial Science Program at Robert Morris University. The RMU program was designated a Center of Actuarial Excellence in 2010. 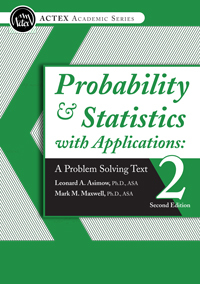 His co-author, Mark Maxwell, ASA, PhD, directs the University of Texas Austin Actuarial Program. Len Asimow (LA): Writing formulas in Mathtype can be tedious and time consuming. On the other hand, the process can be relaxing and therapeutic, sort of like playing solitaire on the computer. So I don't mind it so much. Without a doubt the worst part is the endless struggle to rid the text of those bedeviling tyops (ðŸ˜€). Not to mention the embarrassing math errors. LA: Well, first I read the Wall Street Journal for a couple of hours, then I answer emails, prepare for class, go for a walk, eat lunch, etc. By the time the muse strikes, it's pretty much time to head home for the day. This will help explain to the publisher why it took so darn long. AL: How much do you enjoy writing on a scale of 1 to 10? MM: The answer is a probability distribution with mean around 5 and an exceedingly large standard deviation. LA: I used to be a runner; then I became a jogger; then a walker. Now I pretty much shuffle along like an old man (which of course I am)â€¦but I do try to get in a few miles every day in the great outdoors. I also read and park myself in front of the TV watching sports. I know, get a life. LA: The Pronghorn Chronicles. It's about a math professor at the University of Wyoming who runs every day out on the vast and barren prairies surrounding Laramie, WY, encountering nothing but sagebrush and the occasional herd of Pronghorn antelopes. He also has a penchant for writing acerbic letters to the editor of the Laramie Daily Boomerang (a real newspaper) under the pseudonym Colonel Pronghorn. It would be loosely autobiographical. LA: I really wanted to write a best-selling novel of international intrigue and romance; a riveting page-turner impossible to put down. Unfortunately I have neither the skills nor the aptitude for that. So I settled for a book on prob/stats instead. That happened to be something I had a handle on since I've been teaching the material since roughly the time when Pascal and Fermat became pen pals and invented probability. LA: It took a lot longer than I would have predicted. LL: Just do it. It's fun to see your name on a book cover, even if it's just an obscure math text. LA: One day in 1996 or 1997 the FBI knocked on my door in St. Louis. They wanted to know how well I was acquainted with someone named Theodore John "Ted" Kaczynski, aka The Unabomber. Turned out that Kaczynski and I were both mathematicians at UC Berkeley in 1967. I would have loved to have told the agents that, yeah, there was something definitely off about that guy and I just knew that he would be revealed to be a serial murderer someday. Sadly though, I had no recollection of him whatsoever. But we worked in the same general area and chances are good we met at a seminar or something. It's definitely weird to think I probably shook hands with the Unabomber.